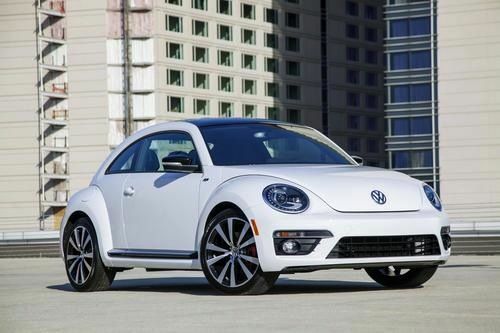 The U.S. market 2014 Volkswagen Beetle Convertible is getting sportier with an all-new R-Line package both inside and out. Most of the time the European market gets the sporty new vehicles and the U.S. market gets left with what the Germans think will sell here in North America. But Volkswagen is offering a whole lineup of sporty R-Line models here in the U.S. The recently introduced sporty R-Line trim is being offered on the CC R-Line, Beetle R-Line coupe, and the recently introduced Tiguan R-Line and Touareg R-Line. Volkswagen announced at the 2013 Chicago Auto Show that it will offer the R-Line trim on another model for the U.S. market, the 2014 Beetle Convertible R-Line will be added to the Volkswagen line-up. The new 2014 Beetle Convertible R-Line package gives the all-new Beetle drop-top a whole new level of sport. Now the fifth car in the Volkswagen R-Line family, the sporty features will be both outside and inside. While the new sporty R-Line convertible options don’t enhance the actual performance numbers of the Beetle, they do make it look faster. The new exterior and interior options can be combined with any of the Beetle’s colors. It starts on the outside as the exterior package gets a host of features that will definitely enhance the sporty look of the popular two-door car. The 2014 Beetle Convertible will come with a hot turbocharged engine underneath to go along with the new R-Line exterior treatments. The Beetle Convertible R-Line adds performance-inspired exterior enhancements like unique 19-inch aluminum-alloy wheels wrapped in lower-profile all-season perfromance tires. It will also be paired with the Beetle Turbo’s sport-tuned suspension, that gives it more dynamic driving characteristics. Additional enhancements include an R-Line badge on the front grille and Bi-Xenon headlights with LED DRLs. Inside, the Beetle Convertible R-Line features “metallic-finish” dash and door trim; a sporty flat-bottom R-Line multi-function leather steering wheel; stainless-steel R-Line scuff plates; aluminum sport pedals; and leather sport seating surfaces. Other interior appointments include the RNS 315 navigation system; Keyless access with push-button start; and the award-winning Fender® Premium Audio System, which delivers rich sound via a 10-channel, 400 watt amplifier with eight speakers and a rear subwoofer. The new 2014 Beetle Convertible R-Line won’t be as much go as it will be show. But the new R-Line treatment definitely gives the new Beetle drop-top a sporty look. U.S. pricing will be announced closer to launch later this year. Watch the new VW Beetle R-Line appearance package video below for a full preview.